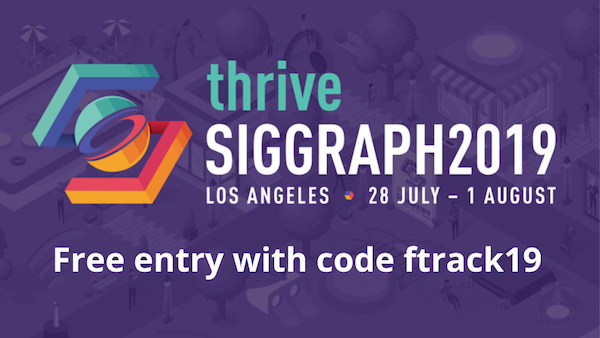 We’re pleased to announce that ftrack is exhibiting at SIGGRAPH 2019 this 28 July-1 August at the Los Angeles Convention Center. For over 40 years, SIGGRAPH has stood as the world’s largest annual conference on computer graphics. From the latest visual effects and animation technology to VR and game design, SIGGRAPH 2019 offers courses, talks and panels that make for a crash course in the latest research and techniques. We’re also excited to share our free entry code to SIGGRAPH 2019: ftrack19. To register for a free entry pass to the largest computer graphics conference in the world, simply use the code ftrack19 when registering for a “non-member” account. Feel free to share the code with colleagues and friends to gain free entry to SIGGRAPH 2019! We’ll be available for meetings throughout SIGGRAPH 2019. We’d love to meet up to chat about ftrack Studio and ftrack Review and where we’re taking the product next. If you’d like to schedule a meeting with the ftrack team at SIGGRAPH 2019, please get in touch to arrange a time.